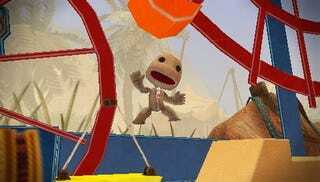 The PlayStation Portable port of LittleBigPlanet may be expanding its downloadable content offerings with the addition of "purchased levels," as spied in the most recent playable version of the game. Siliconera spotted the menu option during a recent playtest of the PSP game, a choice that sits alongside "story levels" and "downloaded levels." Clearly, "purchased" and "downloaded" could easily overlap, but Sony may be setting us up for more pay-to-play content. Not that that's such a bad thing. There are plenty of Sackboy costumes and accessories up for sale, but little in the way of professionally created LittleBigPlanet levels. Media Molecule's Alex Evans recently discussed the option of selling some of that downloadable content to owners of a possible LittleBigPlanet 2, but didn't provide much in the way of specifics. Hey, if it means getting LBP levels on par with the Metal Gear Solid-themed releases, we're all for it. Let's start making better use of those Team ICO costumes, 'kay?